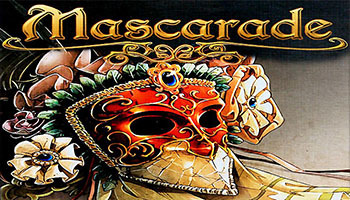 The first edition of Mascarade contains 13 characters. The beggar (woman) has no special ability. Bruno Faidutti says on his blog: "...she has no ability so far. I always like to find blank cards in a game, for which I can imagine my own effects. Here, the card is not blank - it has a picture and a name, but you can devise its effect, and I'm sure there'll be some prize for the best idea". Mascarade is a character-based bluffing game for 2 to 13 players. Each player has one face-down Character card. During the game, the players will swap characters and no one is ever sure of the card they have in front of themselves! The object of the game is to use the powers of the characters to obtain 13 gold coins. However, if any player goes bankrupt, the game immediately ends and the richest player wins the game.